Until today the only Painted Buntings I had ever seen were in Honduras. And, despite their absurdly gaudy appearance, I am sad to say that those buntings were not given their due because of the sheer volume of insanely good birds that were there for the watching. This bunting was different. 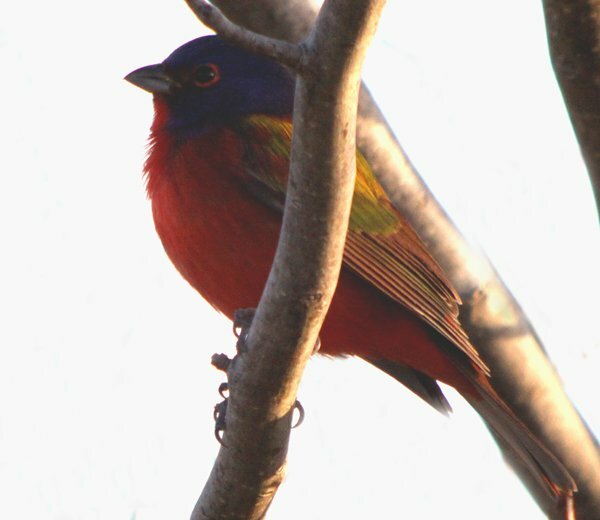 This was an absolutely gorgeous adult male Painted Bunting in Connecticut in November. 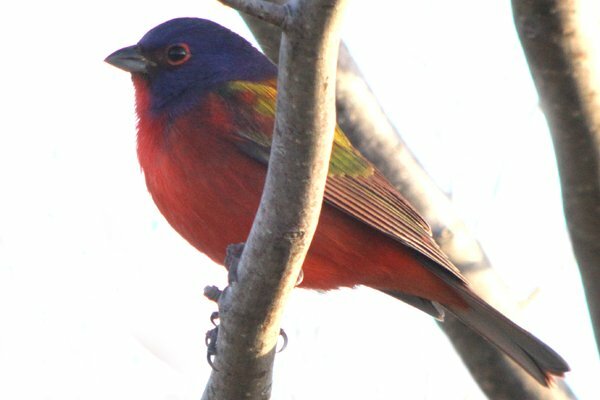 Nothing was going to compete with a Painted Bunting in Connecticut in November. If you find yourself asking why that would be then you have clearly never seen an adult male Passerina ciris. Here, let me fix that for you. Seth Ausubel, Mary Normandia, and I had a great time joining a bunch of other twitchers in Cove Island Park in Stamford, Connecticut, which astute 10,000 Birds readers will remember from another twitch that I was on a little over a year ago. And while a Painted Bunting is nowhere near as rare a bird as a Fork-tailed Flycatcher it is still a great bird in the northeastern United States, especially when it is a crimson, indigo, emerald and canary male. It was a joy to watch and digiscope and it was almost as much of a joy to watch others see the bird. It is hard to believe that a single bird could have so many brilliant colors but there it is, just waiting for someone to come along and stare with mouth agape. Speaking of, how about getting some drool on your keyboard? This post has been submitted to Bird Photography Weekly #170. Go check it out! I would love to see one of these beautiful birds…!!! Curse you, Corey Finger. You and your new ABA birds too! Glad you were able to come up to CT and see this beauty Cory. Great to see you! And as the same with you, this was one of those nemesis birds that eluded me in both Fla & TX. What a great bird to see here in CT if however briefly. A few more images to come shortly! One more for my ABA list! What is it with Painted Buntings in the northeast these past few years? When last we left NJ, in 2003, that was still a red-letter bird anywhere north of VA; and now it’s become a “rare-but-regular” all the way to Nova Scotia. Better start watching the feeders here in Little Falls. Great pictures of a great bird, Corey. Absolutely beautiful. It looks like a little kid colored a bird. Those photos gave me chill down my spine. Awesome twitch! Meanwhile, I dipped on a Common Redpoll here in Utah. Darn! I thought one had to go to the tropics to spot such a beauty. I’m surprised that such a colorful bird can be found in New England. Ach! What is it about colours and North American birders? Geez… overrated, I tells you, just overrated! Such an incredibly colorful bird. How cool to see one in the northeast! Solid bird. I dipped on one here the other day…but it was not of the rainbow plumage. 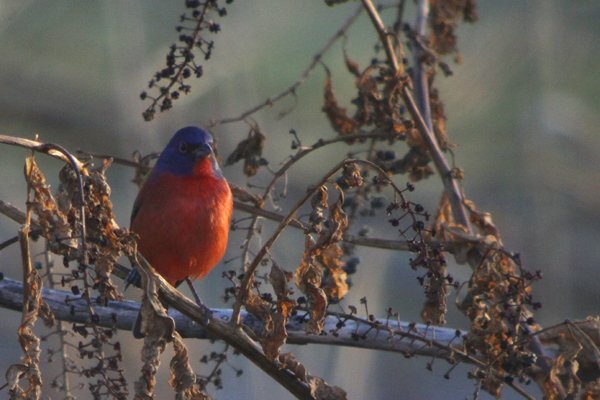 Coming from the land of Painted Buntings, this is one bird that must be seen to be believed. I can’t imagine how killer that bird must have looked surrounded by winter brown and gray, though. As if they need more staging. Aaaahhhh….. now THIS is a bird worth chasing! Now that we in the NE are moving into the muted colors of winter, this bird screams, LOOK AT ME!!!!! Gaudy? I don’t think so, rather, it has its own rainbow! We missed it yesterday, Corey. So glad you had a chance to take such incredible photos! Corey, the pictures are stunning! 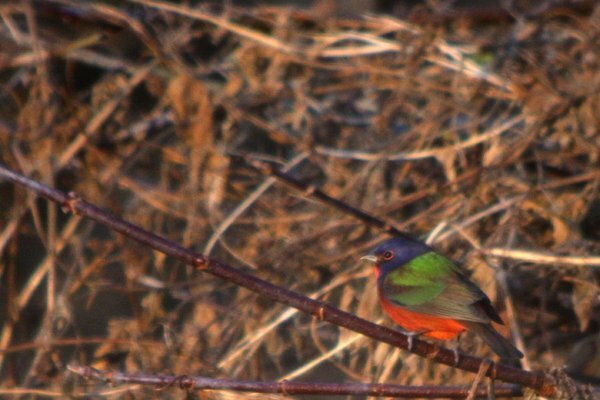 I had the pleasure of seeing this beautiful “Painted Bunting” in my yard in Mystic, CT this past fall. I could not believe my eyes!!!! !